This is my special Veggie fish sauce which could be used as a filling for pancakes, used to eat rice, yam, or anything you can think of. It is Rich in protein and filled with essential vitamins. enjoy! Wowww! Nice one girl...U doing good. 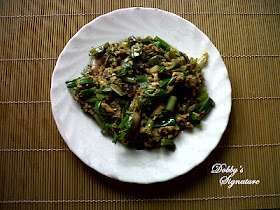 i love ur blog......... and its inspiring me to try more cooking. i love ur blog and it has inspired me to try more cooking as soon as i find the time. what is a green chilli? where can I find rosemary please? love ur blog so colourful!! Hi Dobby, can this be served with Yamarita? I planning to spoil my man one of this days with something different. Dobby bless you!! My family loved this! I served with pancakes but omitted rosemary as I had none. I used thyme instead Love u!